Smooth vocals and warm trumpet sound backed by a 17 piece big band and string orchestra. Just entering his thirties, Joe Gransden has already performed worldwide and released four CDs under his own name. Renowned first for the hard bop approach of his trumpet, Gransden’s singing voice has been compared to that of Chet Baker and Frank Sinatra. "When I first heard Joe five years ago, I immediately thought of Chet," says Jazziz magazine critic James Rozzi, “but lately his voice has taken on its own style with a deeper resonance. His trumpet has always alternated lyricism with an aggressive, angular approach. He has the ability to cover the gamut of emotions." 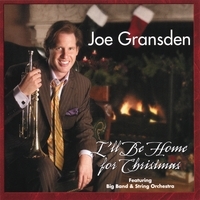 Born January 7, 1971, Joe Gransden is from just north of Manhattan, in Yonkers, New York. Coming from a family full of musicians, Joe’s introduction to music came early on through his father, a gifted singer and pianist. His grandfather was a trumpeter of merit, playing professionally his whole life throughout New York. On his mother’s side of the family was the piano virtuoso Carmen Cavallero. Not long after high school, Joe was on the road as a sideman with the big bands of Tommy Dorsey and Glenn Miller. A number of A.F.M. contracted sideman gigs include Barry White, The Moody Blues, Kenny Rogers, The Temptations, Aretha Franklin, The Whispers, etc. Eventually moving to New York City, he performed with numerous groups, including sub work with Toshiko Akiyoshi and Chico O’Farrill. Meanwhile, Joe formed his own group, which performed in Brooklyn each week and included the venerable guitarist Joe Cohn and ex-Betty Carter bassist, Matt Hughes. “Having my own group and being fortunate enough to travel, play, and record has been a dream come true,” says Joe. “Exploring the music with a steady group of great players has enabled me to continually grow.” The Joe Gransden Trio’s growing legion of fans in both New York, and recently in Atlanta have obviously taken note. In Atlanta, where Joe’s trio plays steadily four nights a week in as many venues, his loyal following includes an array of people from blue-collar workers to upper crust businessmen who all share a love of good music. Like many developing jazzmen, Gransden’s early influences, which include Kenny Dorham and Miles Davis, were easily recognizable in his playing throughout his formative years. "Emulating the jazz greats is always the very first step," says the historically-rooted Gransden. "But obviously, in order to be true to myself—who I am, what I believe in, my family background—I need to have a sound that’s my own. It’s taken me until recently to hone in on that voice and explore its potential. One of the truly enjoyable things about my career has been finding that my audience appreciates my individual talents." A widening schedule has found Joe performing at The Jazz Corner in Hilton Head, South Carolina, The Museum of Art and Design in midtown Manhattan, and Tehema Golf Club in Carmel, California (where Joe recently played a party for Clint Eastwood). Fellow musicians across the country hear a talented trumpet player whose ace in the hole is a well-developed voice. But around Atlanta and New York Joe is also a well-respected human being, a nice guy who treats people fairly. He has always managed to keep every aspect of his career and life in balance. In this tempestuous decade, Joe’s lyricism is like a breath of fresh air.